Everybody’s doing it… no not that! Painting Furniture! Painting your furniture is a great way to save money by updating what you already have or sprucing up thrift store bargains. It’s also a great creative outlet and a way to earn a little extra income by selling your updated creations. You can see some of my furniture rescues and rehabs here! But, do you know what type of paint to use? Here’s your Definitive Guide. Latex Paint is a great paint to use. It often gets pushed under the rug with so many other paints made for painting furniture alone. But, if you will not be distressing your furniture. (You can distress latex paint, but I think it gets kind of gummy. There are better choices for distressing) Or if you want a high shine, gloss or satin finish this is a great choice. Another benefit of using latex are the color options. Any color you can image can be custom mixed for you. When you paint with latex just make sure you prep your surface with a good cleaning, sanding and a coat of primer for durability. You can find great latex paints at your local hardware store so they are readily available. My personal favorite! Milk Paint comes in a powder form. (If it comes in a can, it is not real Milk Paint.) You have to mix it in batches and if you don’t use it, it will go bad. So, only mix up a small amount at a time. Milk Paint will give your furniture a unique chippy finish. You can layer your paints and achieve that chippy farmhouse look with Milk Paint. You can learn more about Milk Paint HERE. Minimal prep is needed for milk paint and you can paint just about anything. Don’t be intimidated by the fact that you have to mix this paint. Once you try it you will love it! These paints are usually carried in boutiques with a trained stockist to show you the ropes and I highly recommend signing up for a class. You will learn so much! Chalk Paint/ Clay based paint is a great option for painting furniture. This is the paint to use when you want to achieve that distressed, old world French look. With the addition of dark waxes and glazes the options are endless. This is not the same as chalkboard paint, so don’t get it confused. Generally these types of paints are sold in boutiques with a trained stockist available to walk you though the process. Or you can probably sign up for a painting class to learn different finishes. It is pretty easy to use and easy to distress. Some brands you can distress just using a wet rag, no dust! Hopefully that helps you narrow down your paint options a bit. 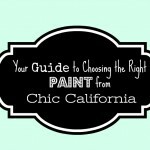 For more information about painting furniture and tutorials come and visit me at www.chiccalifornia.com! Thanks for this post! I don’t use paint often and when I do I am not always sure what kind I need. Pinned! This is so helpful–I’m such a beginner when it comes to painting! Thanks Adrienne!